Welcome to the Cardinal Cerretti Chapel, in the grounds of St Patrick’s Estate, Manly. 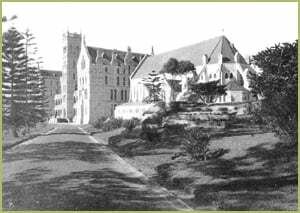 Curiously it was not until 1935, over twenty years after Cardinal Moran’s death in 1911, that the final physical manifestation was made of Moran’s vision of St Patrick’s College, in the building of the chapel. That it be so long delayed witnesses to the enormous costs that such enterprises placed on the Catholic community, particularly given the acceleration of the prodigious demands that school building had imposed on Catholic finances historically. But the delay also raises the question of priorities: did the splendid public sermon in stone which was St Patrick’s come before proclamation of its spiritual core? In 1935 the Cardinal Cerretti Memorial Chapel was opened adjacent to and in architectural harmony with the main building, enhancing and enriching the total atmosphere and impressive power of the site. Despite (or rather in addition to) the Roman, Vatican, implications of the name, the Cerretti Chapel was another affirmation of Australianness. Cerretti had come to Australia in 1915 as the first Apostolic Delegate, diplomatic representative of the Papacy in Australia, a role he regarded as ambassadorial, national, and independent of local bishops. This placed him in conflict with Michael Kelly who had succeeded Moran as Archbishop of Sydney on his death in 1911. Kelly regarded St Patrick’s as a troublesome creation of a Moran he disliked, a situation which placed both College authorities and students in alliance with the new Delegate. Cerretti delighted a St Patrick’s College prize giving in 1916 by proclaiming ‘Australia for the Australians’. To thus name the spiritual heart of the College was entirely appropriate, diplomatically well judged in declaring its allegiance to the Papacy, and with the piquancy of an implied snub to Kelly. The Chapel, built forty years after the Seminary, in 1934-5 complements the seminary in Gothic style, materials and details. It was designed by the Architects Hennessy, Hennessy & Co. The east end is convenient to the seminary and has an emphasis on function rather than architecture; the architectural highlight is the cluster of chapels at the west end and the 20th century structural devices which enabled the column free interiors without massive buttressing. The ‘cloister’ aisle along the northern edge of the building, with its sequence of altars, is a distinctive and well-lit space. It is a lofty single storey building with organ and choir loft and cloisters. The nave is column-free, and features an uninterrupted vaulted ceiling with silky oak joinery, jarrah parquetry flooring and decorative plaster. The special features of the sanctuary are marble altar, sandstone altar canopy and terrazzo flooring. The chevet end displays fine marble altars and magnificent stained glass windows. The major windows appear to be of English manufacture, the lesser ones of local manufacture. Conservation works completed in 1996 include repairs to slate roof, gutters and downpipes and stonework. Inquiries for use of other buildings or grounds should be directed to the Administration of the International College of Management Sydney on telephone 0418 896 959. The Archdiocese is willing to make the Chapel available for religious services and for other suitable community activities. The following guidelines are provided for the information of intending users. The Chapel is available for use for religious worship, for Catholic weddings, and on occasion, for other suitable community activities that are compatible with its sacred character. Suitable activities would include musical recitals and religious dramatic presentations. The Chapel and St Patrick’s Estate grounds are not available for weddings conducted by civil celebrants. All decisions about the suitability of any proposed activity are made by the Chapel Manager with reference, if necessary, to the Archdiocesan Property Manager. A cancellation fee of the full payment will be charged if a booking is cancelled with less than three (3) months notice. A cancellation fee of $350 will be charged if a booking is cancelled with less than twelve (12) months notice. A cancellation fee of $200 will be charged if a booking is cancelled with more than twelve (12) months notice..
Saturday/Sunday (1 May – 30 September) 11:00am, 2:00pm, 4:00pm. Requests for wedding booking times outside of these standard booking times can be discussed with the Chapel Manager at the time of booking, however, the Chapel is invariably not available for use on Fridays before 4:00pm during School term time. Couples are required to arrange their own Celebrating Catholic Priest or Deacon. Couples are asked not to approach the parish clergy at Manly unless one is a parishioner as they are usually fully committed in the parish church. It is strongly recommended that couples engage in a formal programme of marriage preparation. Details can be obtained from the Celebrating Catholic Priest or Deacon. A brochure on Centacare pre-marriage courses is available from the Chapel Manager. There are church and government registers at the Chapel and it is the responsibility of the Celebrating Catholic Priest or Deacon to complete all necessary paperwork. There is a small quantity of stationery and certificates in case of emergency. Some liturgical vestments are available but Celebrating Catholic Priest or Deacons are encouraged to bring their own alb or soutane. A personal offering to the Celebrating Catholic Priest or Deacon is the responsibility of the couple. The Chapel will be prepared according to the requirements of the couple. These should be discussed with the Chapel Manager. The Chapel Manager can assist with referrals to an organist or florist. If there are multiple weddings on the same day it is suggested that couples co-operate and share the expense of flowers. Use of decorations that mark the fabric of the building or its furniture or litter the grounds (eg. rice or confetti) is prohibited. Photography (still and video) is permitted but the photographer should be warned not to intrude into the ceremony. As a courtesy the photographer should liaise with the Celebrating Catholic Priest or Deacon who will have the final decision on how photography will be conducted. Moderate use of the grounds for photographs is permitted in the immediate vicinity of the Chapel before and after the wedding. Couples are asked to be punctual and to ensure they vacate the grounds at least 15 minutes before the commencement of any other wedding as a courtesy to the other couple. A pipe organ is available in the Chapel. The organ is played by an organist contracted to the Archdiocese and is not available for general play by the public. Requests to play the organ by other than the contracted organist will only be entertained in exceptional circumstances. Music played in the Chapel should invariably be live performance and strictly in accordance with the liturgy and also acknowledging the sacred nature of the Chapel. Decisions in relation to the appropriateness of the music to be played will be determined by the Chapel Organist. The Chapel is an historical heritage-listed building. The upkeep of the Chapel depends entirely on the generosity of those who use it. The cost of maintenance, insurance and employment of staff is significant. Other than for religious services intending users will be asked to make a suitable contribution to help offset some of these fixed costs. The amount of the contribution is always negotiable depending on the nature of the proposed use, and the circumstances of those involved. This can be discussed with the Chapel Manager. With respect to religious services there is no prescribed fee but an offering would be appreciated. As a guide it is suggested that the offering on the occasion of a religious service such as a wedding would be $1,200.00. At the discretion of the Chapel Manager, depending on the proposed use, a security deposit may be required which will be forfeited in the event that there is any damage to the Chapel or grounds. In some cases separate liability insurance may be necessary. Offerings or contributions should be paid by credit card, cheque or money order in favour “Catholic Archdiocese of Sydney” and paid in full when returning the booking request form. Goods and Services Tax – The Cerretti Chapel is owned by the Catholic Archdiocese of Sydney which is a registered entity and a charitable and religious institution. In accordance with the legislation and ATO rulings, there is no GST payable for a religious service, or for a non-commercial supply by a charitable institution. With respect to offerings on the occasion of a religious service no tax invoice will be issued. With respect to other contributions no tax invoice will be issued unless requested. GST will only be included in such contributions where the amount of the contribution exceeds 50% of the market value of the supply. This can be discussed with the Chapel Manager. The entry to the Chapel is via the passage between the Chapel and the main college building. Only the bridal cars or other official cars may use the ceremonial drive in front of the main building. Pedestrian access for other guests will be via the secondary gate opposite St Paul’s College, where parking may be available by arrangement outside school hours. Parking in the grounds of International College of Management Sydney is limited and reserved for the disabled. The Chapel Manager will give specific directions if necessary. Guests are requested to respect the operations of International College of Management Sydney and the privacy of its residents and should confine their activity to the grounds in the immediate vicinity of the Chapel.